United We Stand Patriotic Lanyards With Fashion Look! "United We Stand Patriotic Lanyards With Fashion Look! - Love You Country Without Loosing Fashion ! Great For Fashion ID, Military, Sports and Patriotic Events. 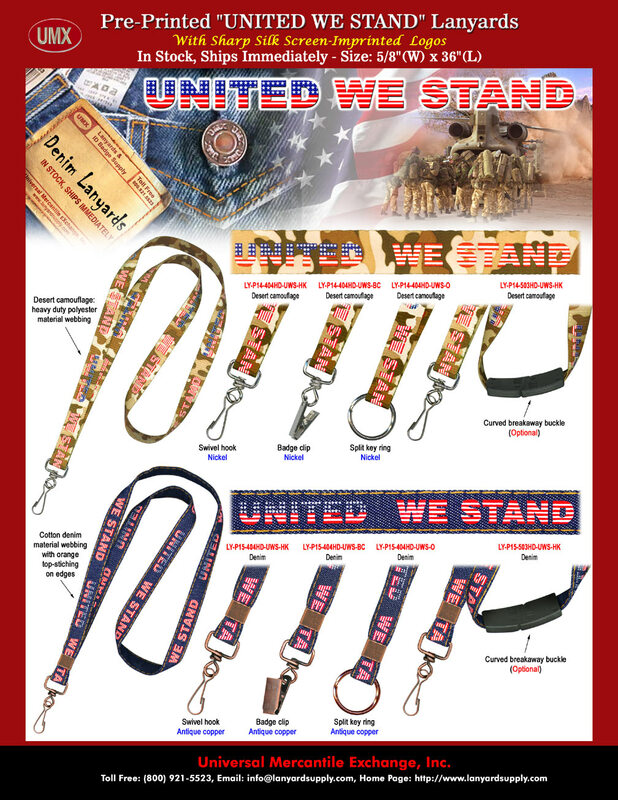 The pre-printed "United We Stand" denim lanyards are great for variety of patriotic events. Our "United We Stand" denim lanyards are made of comfort to wear denim-cotton material. The denim "United We Stand" printed lanyards come with antique copper color swivel hooks, badge clips or key rings. The desert camouflage "United We Stand" printed lanyards come with nickel color swivel hooks, badge clips or key rings. You are viewing Lanyards > Ez-Adjustable Neck Wear Models > United We Stand Patriotic Lanyards With Fashion Look!